New Mum Online: Getting Married? Planning a Hen Weekend? Then this blog post is for YOU! Getting Married? Planning a Hen Weekend? Then this blog post is for YOU! Are you getting married and in the process of planning your hen weekend? You may even be leaving the latter to your chief bridesmaid to arrange - I know that's the done thing nowadays. When my cousin got married in September last year, her chief bridesmaid even set up a private Facebook group to coordinate it all and communicate with everyone. My marriage proposal was in my FAVOURITE restaurant and was on Valentine's Day, so this post is quite timely. My dearly departed Father-in-Law's birthday was on Valentine's Day and I found it surprising when we said goodbye to him and headed out for the evening, with ME being allowed 100% choice on where we went. Despite the restaurant being nearly 90 minutes away, THAT was where I wanted to go. During the meal my now husband, put his hand in his inside jacket pocket a few times and I did wonder what he was up to, but tried to put it out of my mind. Instead I enjoyed the company and the food. I have always loved my food! 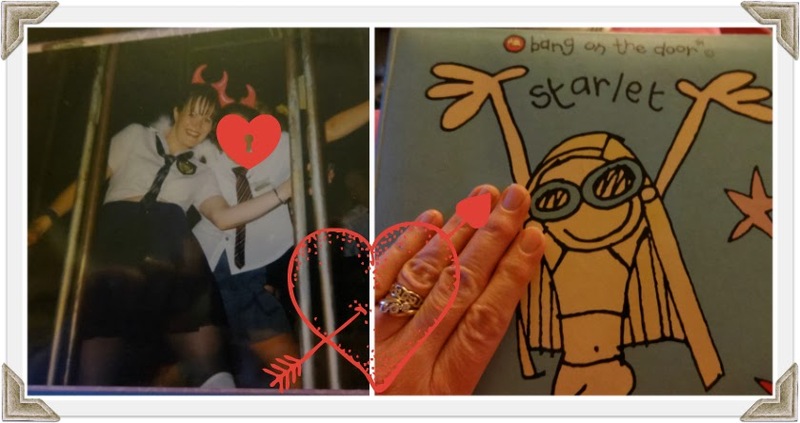 I was proposed to, by my childhood sweetheart on Valentine's Day 1999. When he went down on one knee I immediately got tears in my eyes, (actually I cannot trust my memory, I think I may have actually cried) and was pulling his arm, begging him to get up, so I could wrap my arms around him, but he stayed put till all his words were out. Once we finished our meal ALL I wanted to do was RUN to the pay-phone to ring my Mum in Ireland to tell her the news. I did just that! Another reason this post is timely, is that since Aaron came along I stopped wearing my engagement ring as it was too sticky outy! Spookily I have been wearing it the last few days and really enjoying fiddling with it and looking at it. It's helping with my plan to be more feminine and glamorous in 2014 :-) It's only taken a few days of wearing it for it to feel totally normal, BUT I can't sleep with it on! It's too sticky outy like I said! My proposal of marriage and our engagement party were in the UK, but our 2001 wedding was in Ireland. I quite literally had my dream wedding. My Hen Night was in School Disco in Hammersmith. I organised everything myself. I don't think it's there anymore but was once a regular hangout of mine. I REALLY wanted a hen weekend but (a) they weren't nearly as common back then and (b) I knew I would be expecting a lot of people to fly to Ireland and I couldn't expect people to travel twice. Back then digital photography was not at all the norm, so I actually have a whole album for my PRINTED hen night photos - they're not lurking on a computer anywhere. They are so fun, I find myself regularly looking at them. I reckon the small school skirt I wore that night would probably only fit on one thigh now LOL. Well, if you want to see how others were proposed to or hear those awaiting a proposal describing their ideal, have a watch of THIS video. I'd love it if you could complete the survey below. There is also a competition that you can enter if you would like to win a hen weekend in Leeds, click here for more information. I would love to show you the *best* of my hen night photos but (a) I'd probably have to kill you or (b) they'd need to self-destruct and (c) this is the world-wide web and I have SOME modesty ;-) but I will share this one with you. As you can see (just about) I have a waist that is HALF the size it is now and the same goes for the rest of me! You can't see them in the photo but I even have knee-high black leather boots on - ha, if I tried to get my calves in there nowadays! So, tell me, how was your wedding proposal? This post was a collaboration with Hen Heaven, however all words and opinions are my own (apart from the survey and the great video). Hen Heaven have a great website and if I was to do it all over again (I mean if I was still yet to be wed) I would be looking the London activities section of their site, what with me being a Londoner 'n' all. They have themed things happening nationwide. I am not really up for getting married myself, but I do enjoy a good hen party- yours sounds fun, a good 80s night would suit me! You made me smile and remember my hen-weekend in Majorca which was a riot in many ways. Sorry I didn't do the survey my views are very complicated to just tick a box. I had an arranged marriage so didn't really have a wedding proposal as such! That's hilarious, I used to love School Disco too! My hubby proposed to me in a hotel on a weekend away in Scotland - it was all v romantic.